On May 10, 1974, the U.S. Congress voted to include the Chattooga River as a component of the National Wild & Scenic Rivers System. The designation surprised no one in “Chattooga Country” who had recently seen the remote and almost forgotten river of their ancestry suddenly illuminated by a series of events: the release of the national best-selling novel Deliverance in 1970, the subsequent blockbuster movie in 1972, and the river’s nomination as a candidate for inclusion in the National Wild and Scenic Rivers System. Here, we take a look at the history of the designation of the Chattooga River as a component of the National Wild and Scenic Rivers System. The cultural heritage is rich with both Cherokee and early European lore. The Chattooga River from its origin flows unimpounded by any man-made structure for sixty miles, making it one of the longest free flowing rivers in the southeastern United States. From the resort villages of Cashiers and Highlands in North Carolina, the river flows for ten miles to Ellicott Rock Wilderness and then another forty miles as the border between South Carolina and Georgia. In 1969, a task force appointed by Congress was charged with working with the Forest Service to study the Chattooga River to determine if it was eligible for inclusion. At the time, much of the Chattooga River watershed was already a part of three National Forests: the Nantahala in North Carolina, the Chattahoochee in Georgia, and the Sumter in South Carolina. The Wild and Scenic Rivers Act prescribed that each component of the National Wild and Scenic Rivers System would be assigned to a federal land management agency to administer the act. Since the Forest Service already had significant inholdings in the watershed, it was logical that they would play a key role in the development of the study report to Congress. The task force was made up of a representative from the Bureau of Outdoor Recreation and the governors and forest supervisors of the three states involved: Governor McNair (SC), Governor Scott (NC), and Governor Maddox (GA). Forest Service field teams were assigned to collect data and the task force also consulted with a resource advisory board consisting of the Federal Power Commission, the U. S. Geological Survey, and the U. S. Army Corps of Engineers. Other individuals, state and federal agencies, and public interest groups were also consulted. Public hearings were held in Highlands, North Carolina and Clayton, Georgia to allow citizens’ involvement in formulating the study report. 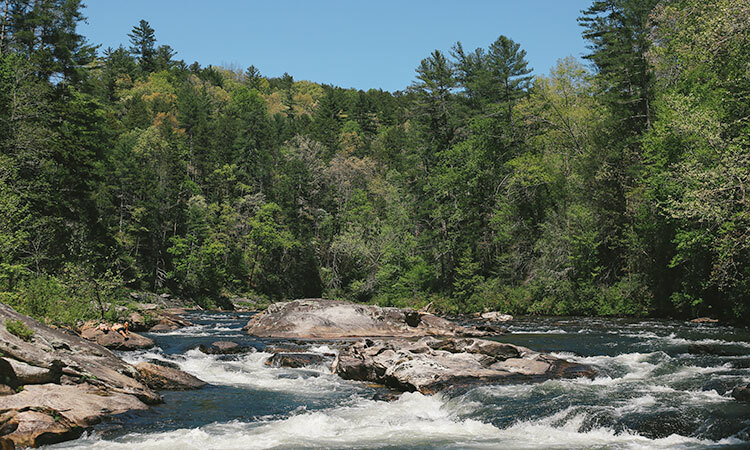 The task force’s charge was to determine eligibility based on requirements that the Chattooga must be “free flowing” long enough to provide a “meaningful experience,” have enough volume to “allow full enjoyment of water- related activities,” have an “outstandingly remarkable” environment, be “generally inaccessible” and “essentially primitive,” and its waters must be “unpolluted.” Other considerations were land acquisition requirements, cost to the government, land ownership patterns, and use. At the time that the task force began its study, the Chattooga River was relatively unknown outside the local communities or the circle of elite resorts of the headwaters and by a few whitewater enthusiasts. 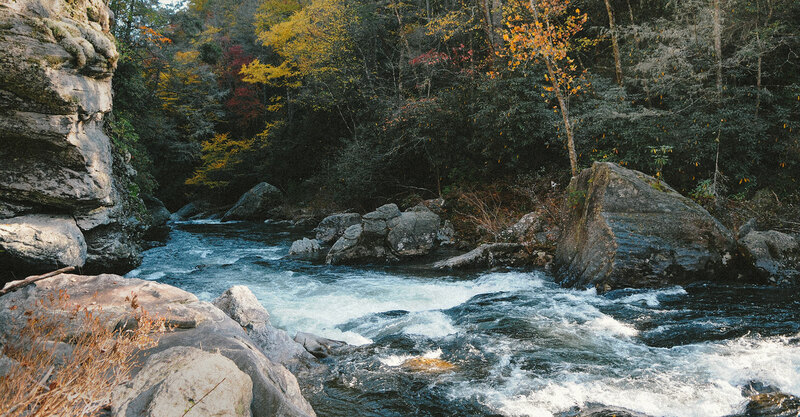 On June 15, 1971, the year after Deliverance was published with such great influence, the task force published its “Wild and Scenic Study Report” on the Chattooga River. The report concluded, “This is one of the longest and largest free-flowing mountain streams in the Southeast remaining in a relatively undeveloped condition.” The report went onto say, “The beauty of the rapids and scenery of the Chattooga drainage is unsurpassed in the Southeastern United States.” The task force concluded that the entire Chattooga River was eligible for inclusion in the National Wild and Scenic Rivers System. The details of the report were compelling. For example, it was discovered that there had been four proposals for hydroelectric dams on the Chattooga: two by the Corps of Engineers in 1935 and 1944, one by the U. S. Study Commission, Southeast River Basins in 1963, and one by the Federal Power Commission in 1969. These dams collectively included sites in Cashiers near Norton Mill Creek, and Warwoman Creek, Sandbottom, Rogues Ford (Hwy 76), Long Creek, Camp Creek, and Opossum Creek. The report concluded that the benefit of protecting a free-flowing river outweighed the potential for hydroelectric power generation on the Chattooga River. Such rhetoric notwithstanding, the fact is that these dams were not economically feasible. To put them in place would mean a huge battle with numerous supporters of the designation. Later, Georgia Power Company would sell more than 5,700 acres of its holdings along the river to the Forest Service. The report clearly showed the overwhelming support for designation. The record from the public meetings and subsequent comments contained over 1,000 statements from individuals, organizations and both state and federal agencies. All were positive with the exception of three individuals and one private hunt club. The report was not without concern, however. Although the task force concluded that the river was not “overused,” it cautioned that future demand could reach saturation and cause a degradation of the “experience” that could be provided by the Chattooga. Consequently, the report recommended development to be guided by preserving a primitive experience as a priority over demand. 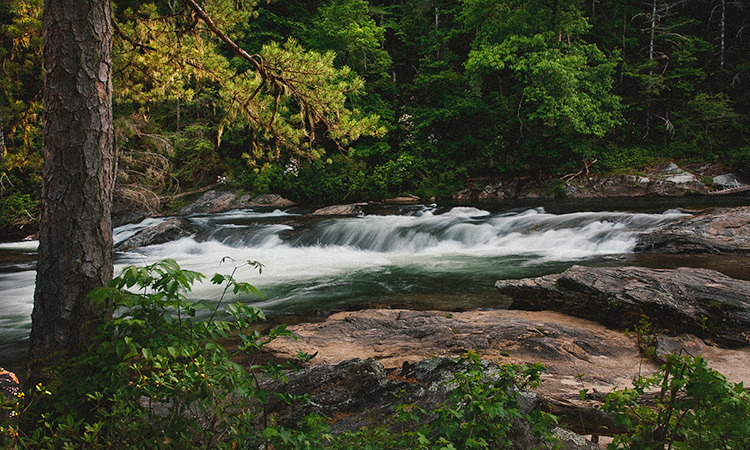 In the final analysis, the few negatives in the report were vastly outweighed by the overwhelming evidence that the Chattooga was eminently qualified for designation as a component of the National Wild and Scenic River System. The next step was for the task force to classify sections of the river according to the amount of development that had occurred on that particular section. A “wild” section was one that represented a “vestige of primitive America” and was relatively inaccessible. A “scenic” section was one judged to be still primitive with some road access. A “recreational” section is one that is readily accessible with some development. In all, 39.8 miles of the Chattooga were recommended for “wild” status, 2.5 miles as “scenic,” and 14.6 miles as “recreational,” for a total of 56.9 miles. The task force proposed designation of the Chattooga as a Wild and Scenic River along with an action plan for managing the river in compliance with the National Wild and Scenic Rivers Act. These plans included acquisition, development recommendations, and a benchmark monitoring system. The cogs of government turned slowly, but finally the Chattooga River was officially designated three years later. In retrospect, and in consideration of the official designation of the Chattooga as a Wild and Scenic River, it is clear that much has changed. Now there are more than 100,000 boaters who visit the river on a “good water” year. Many of the original recommendations for management of the river have fallen by the wayside. Demand seems to have taken over as the chief driving force behind Forest Service management. Development has taken its toll in spite of many of our best efforts. Federal dollars for much needed land acquisition have all but dried up. The Forest Service has erred much in favor of heavy road building and even- age timber management. It seems that land managers have lost touch with the original intent of the Wild and Scenic Rivers Act to prioritize “experience” over demand by special interests. On the bright side, we have made much progress in understanding the dynamics of a watershed ecosystem. Many people have come and enjoyed the beauty and excitement of a great whitewater river, while others have been inspired by the rare solitude of the Chattooga River. Yet we must not forget that unless we maintain eternal vigilance, the inspirational vision of the Wild and Scenic Rivers Act will be eclipsed by those forces that would exploit wild places for selfish gain. Citizens’ involvement is the key to ensuring natural resource protection.